Key words: sediment hosted massive sulphides; “Sedex” zinc-lead deposits; “MVT” zinc-lead deposits; Sumatran Fault System. 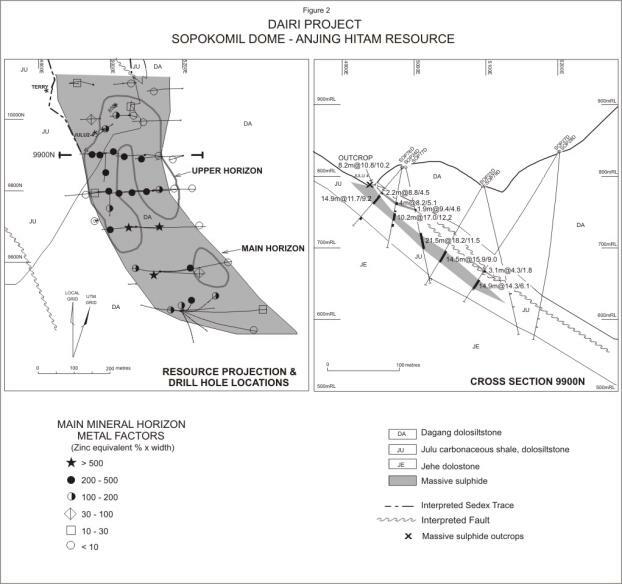 Sediment hosted, massive sulphidic, zinc-lead mineralisation was first identified by Herald Resources Ltd in the Sopokomil district of Dairi Regency, North Sumatra, during preliminary reconnaissance and stream sediment sampling in late 1997, prior to granting of a Generation VII Contract of Work. Staged exploration for stratiform, possibly sedimentary exhalative (“sedex”) style mineralisation resulted in the tracing over about 5km of strike on the NE flank of the complex Sopokomil Dome a series of horizons and lenses, referred to as the “Julu Sedex Zone” (JSZ) in laminated carbonaceous shale and dolomitic siltstones, of the designated Julu Member,. Extensive, but lower grade base metal and silver rich mineralisation in several styles, in particular the designated “Jehe Mississippi Valley type”, has been discovered in the massive dolostone footwall units which form the core of the Sopokomil Dome. The local lithostratigraphic sequence is part of the poorly constrained Permo-Carboniferous age Tapanuli Group, the basal rocks in this part of Sumatra. Exploration programs over the past 5 years including stream sediment sampling, gridding, mapping, ground and airborne EM surveys and diamond drilling of 20,953m in 87 holes, has broadly traced the mineralisation around the dome. This culminated in the selection of the Anjing Hitam deposit as subject of a Prefeasibility Study conducted between July 2002 and June 2003. The Anjing Hitam deposit comprises a lower “Main Mineral Horizon” (MMH) and a discontinuous, thinner “Upper Mineral Horizon”, about 10-20m higher, but affected by a hanging wall shear zone and not considered for mining at this stage. The terrain has always dictated that the deposit could only be extracted by underground mining and the basis of the Prefeasibility Study was the mining and extraction at a rate of 1Mtpa. The mining scheme designed for the difficult 40-45° mining angle, and poor hanging wall condition, proposes the extraction of 6.323Mt ore from the MMH at a grade of 16.0% Zn, 9.9% Pb; processing in a conventional flotation concentrator to produce separate lead and zinc concentrates and trucking to the main port of the province for shipment to overseas smelters. The production of 745,100t net smelter payable zinc metal and 471,100t net smelter payable lead metal is envisaged over the 6.6year mine life. It seems likely that further viable resources will be demonstrated in a number of prospects elsewhere in the JSZ. The Dairi Generation VII Contract of Work (CoW) was granted to PT Dairi Prima Mineral (Herald Resources Ltd 80%, PT Aneka Tambang of Indonesia 20%) in February, 1998. The CoW is largely in Dairi Regency, North Sumatra Province and centred about 150km south of the provincial capital Medan. It falls within the rugged, rain forest clad, Barisan Ranges which rise to 1600m locally and being at 3°N latitude, experience wet tropical conditions with 3-4m annual rainfall. The wettest months are September to April. 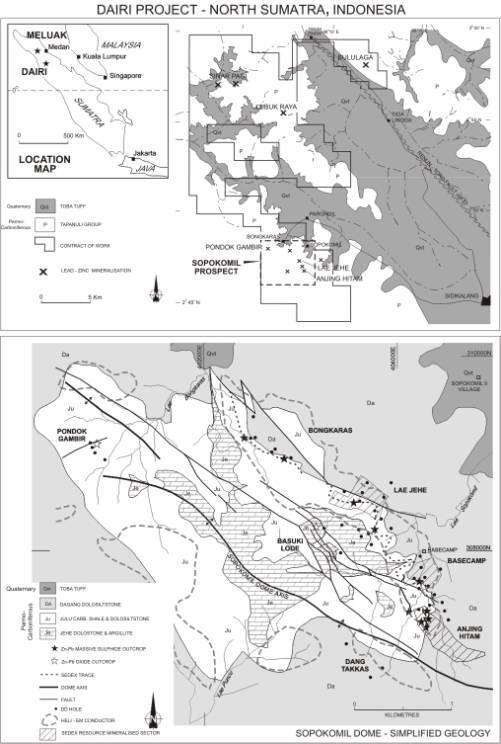 During the course of preliminary reconnaissance for gold and base metals in late 1997, base metal rich, apparently stratiform, massive sulphides were discovered in outcrop in the creek-bed of Lae Sopokomil and were recognised as being at least of a generic “Sedex” style (Lydon,1996, after Carne & Cathro 1982), hosted by black shales and siltstones. This exciting, and somewhat unexpected, discovery immediately focussed the exploration effort in this quarter, and, while varying densities of exploration have been carried out throughout the CoW only minor base metal occurrences have been discovered elsewhere. Initial exploration at Sopokomil in 1998 included stream sediment sampling, streamline mapping, gridding and soil sampling, ground TEM survey and diamond drilling. Over the following years, grid extension, mapping and sampling, successive ground EM surveys, a CoW wide heliborne EM survey, DHEM surveys, detailed drilling at the designated Anjing Hitam locality with a handful of holes in other sedex and carbonate hosted mineral occurrences, metallurgical testwork etc led to the delineation of 10.0 Mt indicated and inferred resources at Anjing Hitam. In 2002 a Prefeasibility Study was commenced to determine the viability of an operation based on the mining and processing of the Anjing Hitam deposit at a rate of 1Mtpa. This study was completed in June 2003 and lead to a Bankable Feasibility Study, which has just commenced and is scheduled for completion by June 2004. This virgin discovery is ostensibly the first of its kind in Indonesia. Van Bemmelen (1970) refers to an occurrence of lead-zinc-silver reported by Dutch colonial officers at Bululaga (Figure 1) in the early 1900’s but only limited production from wacke/carbonate hosted vein style mineralisation is apparent. A regional 1:250,000 mapping survey was carried over much of northern Sumatra by the Geological Research and Development Centre, Bandung in the late 1970’s, with aid and technical assistance from the British Government’s Institute of Geological Sciences and Overseas Development Administration. This led to the publication of the Sidikalang 1:250,000 geological map sheet (in which the CoW falls) and explanatory notes (Aldiss et al, 1983). This provides the geological background to this paper. An associated broadly spaced stream sediment sampling survey obtained high Pb-Zn values from a sample in lower Lae Sopokomil. PT Aneka Tambang carried out regional stream sediment surveys over a wide area in 1991 and 1993 which also highlighted anomalous Pb-Zn in Lae Sopokomil (Simanjuntak, 1992). Limited follow-up work led to the discovery of argentiferous galena-sphalerite bearing quartz veins at several localities in the catchment. Base metal and weak gold anomalism was detected elsewhere in the district and their Prospecting Authority area formed the basis of the Dairi Joint Venture Contract of Work application. From the first recognition of “Sedex” style Zn-Pb mineralisation the Sopokomil district was given high priority status and detailed stream sediment sampling and streamline mapping commenced together with gridding and soil sampling. Stream sediment values to 62,100ppm Pb, 6,390Zn & 16ppm Ag have been obtained, detrital Pb oxide minerals giving rise to the high Pb values. Standard –80# silt sampling with flocculation and mixed acid digest/AAS analysis was used. Soil sampling is nominal C-horizon or maximum ~1m depth with whole sample grinding and AAS analysis. By far the strongest response in soils and silts is over the footwall Jehe carbonate member and streams draining it. Variable stockwork mineralised quartz veins, “MVT” mineralisation and supergene oxide deposit derived metals being fixed in the more alkaline soils are responsible. By comparison, soils over shale hosted sedex mineralisation give rise to generally only hundreds of ppm Zn & Pb and negligible Ag. In 1998 TEM using Zonge equipment was trialled over a small grid area. Good response was obtained over the sedex mineralisation hosting JSZ. In 1999 an expanded grid was subjected to a “UTEM” (University of Toronto EM) survey over the recognised eastern half of the Sopokomil Dome. This provided deeper penetration and interpretation of several anomalous foci around the Julu Sedex Zone have subsequently resulted in massive sulphide drillhole intercepts. A particularly strong anomaly – termed Dang Takkas, was detected on the south-western extremity of the dome. Three holes drilled to date have not resolved the anomaly source.and, while massive sulphides are yet to be intersected in the there, it is still not entirely resolved. A heliborne EM survey of 1179 line km, using an Aerodat Eagle 5 frequency bird, and a simultaneous Scintrex CS2 magnetometer survey, was flown over most of the western part of the CoW. Conductive zones were delineated around the Sopokomil Dome (see Figure 1), complementing and extending the UTEM survey foci. A 14km NW-SE highly conductive trend, 20km north of Sopokomil was a major feature of the survey. Subsequent follow-up suggests that linear carbonaceous, pyritic shear zones in shales may be responsible. Two down-hole EM surveys have been carried out. In 2001 a survey using Crone 4 component gear was successful in discriminating massive sulphide from conductive shale and pinpointing a deep, massive sulphide conductive zone at the Lae Jehe locality. Five diamond drill programs have been completed over the past 5 years totalling 20,953m in 87 holes in. The first 2 were wide-spaced reconnaissance programs over the 3km trend of the JSZ on the eastern flank of the Sopokomil Dome plus some holes into the footwall Jehe carbonate hosted mineralisation. The 2000 and 2002 (Prefeasibility) programs concentrated on the delineation and blocking out of the Anjing Hitam deposit to indicated resource status. Four phases of flotation testwork have been carried out on Anjing Hitam mineralisation, culminating with the 2002 Prefeasibility program which indicated that fairly standard lead-zinc comminution practice, followed by flotation and regrind of concentrates, then cleaner flotation can produce satisfactory grade concentrates at good recovery. Results to date have demonstrated 87% zinc recovery into a 56% Zn concentrate and 80% lead recovery into a 64% concentrate. 3) Trucking concentrates 190km to the port of Belawan for shipment to overseas smelters. 7) Ungeared NPV @10%, pre-tax – USD 61M. The basement rocks of northern Sumatra are the Permo-Carboniferous age Tapanuli Group, generally sub-divided into the poorly constrained flysch dominated Kluet Formation and the overlying (?) shelf carbonate Alas Formation (Aldis et al 1983). In the northern part of the CoW this relationship is apparent while in the Sopokomil district it is not possible to strictly assign the rocks to either and so the local term “Silima Pungga Pungga Formation” is applied and this can be locally sub-divided into several members, all carbonate bearing to a greater or lesser degree. They are relatively weakly metamorphosed but often quite strongly tectonised. The Tapanuli Group rocks are affected by several deformation events – firstly in the Permian (op cit) and one or more in the Mesozoic, with accompanying granite intrusion (Cretaceous? ), observable about 10km south of Sopokomil. The major deformation of the Tapanuli Group occurred in the Neogene with the formation of the Barisan Geanticline (op cit) and the Sumatran Fault System (SFS), which runs NW-SE along most of the length of Sumatra. This has variable dextral transcurrent to vertical movement. Most fold axes in the Dairi region parallel this and SW vergence is apparent in the Sopokomil Dome. Adjacent to the SFS is the Lake Toba caldera from which the cataclysmic eruption of ignimbritic Toba Tuff occurred in the late Pleistocene, burying much of the rugged Barisan topography and covering up to 20,000 km2 area (op cit). The NE catchments draining the Sopokomil district are buried to ~650m ASL. There is a sharp contact with a shelf carbonate sequence – collectively termed the Jehe Member, and essentially massive, fine grained dolostone with no observed fossils but an argillitic septum. The Sopokomil Member contains rare solitary corals and possible algal growths. Erratic carbonate matrixed quartz arenite facies intersected in drillholes may represent sinuous channels. On the SW flank of the dome, and close to the near-surface manifestation of a strong magnetic basement, is some float of a magnetite bearing quartzose lithology which may conceivably be a skarn. This is termed the Dang Takkas Formation but its relationship with the other rocks is not clear. The Sopokomil Dome is about 4.5km long between the closure of the Julu Member (Figure 1). It is aligned NW-SE, with SW vergence and a sense of overturning. It appears to be affected by an axis-parallel steep reverse fault system which causes repetition of the Julu Member. Dips on the NE flank (most understood) range from 30-60°. There appear to have been three ductile deformation events and a late brittle deformation (Marjoribanks, 1999). Elsewhere in the CoW there is a moderately open axial fold system trending NW-SE although most observed dips are to the NE. The main strand of the Sumatran Fault System (Renun-Toro) in this vicinity controls the course of the river Lae Renun while a WNW splay controls Lae Simbelin. This is traceable within the Julu Member from scattered outcrops in creek beds, soil geochemical anomalism and geophysical surveys, together with a scattering of drillholes around almost 5km of strike on the NE flank of the Sopokomil Dome. The main heliborne EM conductive zones are superimposed on geology in Figure 1. The zone varies in character from a single thick horizon, termed the Main Mineral Horizon (MMH), at Anjing Hitam in the far SE, to a thickness of up to 100m with multiple, mostly thinner horizons in the NW. Facies variation appears responsible with more quiescent local basinal conditions at Anjing Hitam while more carbonate-rich detritus is present in the NW indicating more rapid deposition off the dolostone shelf. The mineralisation in the sulphide horizons is commonly laminated, exhibits apparent graded bedding in places, soft-sediment deformation of shale interlaminae etc, but has been overprinted by possible successive early diagenetic stage mineral pulses and several deformation events, including late hydrothermal and tectonic modification. There is a pyrite rich “proto-ore” type which is particularly fine grained, often well laminated and comprising 50-60% pyrite, 20-30% sphalerite, 10-20% galena with minor fragmental shale, quartz and barite. In polished section, discrete pyrite anhedra in the 50m range are set in a sphalerite-galena intergrowing matrix. There are commonly coarser grained, remobilised, brecciated, recemented sphalerite-galena rich sections with more shale fragments and only 5-10% pyrite. There are no other sulphide minerals in evidence. 1) Jehe Vein Type – a brittle fracture filling quartz vein system mostly restricted to the upper 20m or so of the Jehe and not extending up into the Julu; contains coarse sphalerite-galena-pyrite-tetrahedrite/tennantite, the latter quite silver-rich with drill intercepts to 5m @ 2.5% Zn, 4.6% Pb, 92g/t Ag. 2) Jehe Mississippi Valley Type –variably through the member with two styles – a shrinkage/slumping breccia cementing sphalerite-carbonate +/- pyrite in up to 30m thick zones of >1% Zn, eg 28m @ 3.1% Zn, 0.02% Pb, 4g/t Ag; also a matrix replacement style in carbonate matrixed quartz arenite with sp>py>>ga and drill intercepts to 10m @ 7.5%Zn, 0.5% Pb, 10g/t Ag. 3) Basuki Lode Type – occasional rubbly outcrop and creek exposures of brecciated, ferruginised material with erratic high grade zinc oxide (smithsonite + hemimorphite) and lead oxide (cerussite) mineralisation with drill intercepts to 10m @ 6.3% Zn, 6.5% Pb, 149g/t Ag. This type presumed to be recent karst deposited type from descending metal rich solutions derived from weathering JSZ. It is significant that several lead isotope studies of the different JSZ massive sulphides versus Jehe carbonate hosted types indicate that the “sedex” form a distinct population (206Pb/204Pb<19.1 vs >19.1 for Jehe) which appears to be older than the more radiogenic carbonate hosted sulphide types (McInnes, 2001). This deposit at this stage appears to be fairly well constrained and comprises a “Main Mineral Horizon” of about 750m strike length, aligned NW-SE, average 250m dip extent, 12m average thickness, dipping 40-45°to the NE, shallowly plunging @ 15° to the SE, with a discontinuous “Upper Mineral Horizon” 5-20m in the hanging wall. The latter is affected by a bedding/layer parallel hanging wall shear. Resource estimation is based on a block model constructed from wireframing of cross-sections. The blocks are mostly 25m x 5m x 2m thick. Grade and SG interpolation has been carried out using inverse distance cubed using Surpac software. A lower cut of 5% zinc equivalent is used for the sedex mineralisation and no upper cut has been applied. Exercises using nominal cutoff have been applied to some of the sparsely drilled carbonate hosted zones. Current resources are tabulated below and are considered compliant with JORC guidelines. The “mining inventory” is derived from the mining scheme applied to the Anjing Hitam measured and indicated resource block model. It is 6.323Mt @ 16.0% Zn, 9.9% Pb or 21.5% Zn equivalent. Acknowledgement is given to Dave Edwards, the original discoverer of the massive sulphide outcrops, to Rob Seed, the original site senior geologist who carried out much of the mapping and interpretation, his successor Ian Bruce and to Bernie Kirkpatrick for successive resource estimations. Also to our hard working Indonesian geologists: Anton, Sapto, Basuki and Herry and admin staff, especially Emmy and to Lorraine in Perth office for patient and constructive “IT”. Finally to the Board of Herald Resources Ltd for keeping the faith and to Drs M Tumanggor, Bupati (Regent) of Dairi for ongoing encouragement. Aldis, D.T., Whandoyo, R., 1983, The Geology of the Sidikalang Quadrangle, Sumatra. Sjaefudian, A.G., KusjonoGeological Research & Development Centre, Indonesia. Bemmelen, R.W. van, 1970, The Geology of Indonesia, 2nd Edition. Martinus-Nijhoff, The Hague. MacInnes, B.I.A., 2001, Dairi Pb Isotope Data.Unpublished Memo from CSIRO Exploration & Mining to PT DPM. Marjoribanks, R., 1999, An Interpretation of the Geology and Mineralisation of the Sopokomil Zinc Prospect. Unpublished report to PT DPM. Simanjuntak, A.P., 1992, Report on Exploration of the Sopokomil District, Kecamatan Silima Pungga-Pungga, Kabupaten Dairi. Unpublished report by PT Aneka Tambang.